The holidays have me thinking of going to the movies, an occasion that has morphed into many venues, but what has stayed consistent is our desire for escape. When I lived in NYC as a child, going to the movies at Rockefeller Center was a monumental event for which we wore our Sunday best. The film “The Wizard of Oz” played on television every Thanksgiving evening, and we waited all year to see it. Now families own it or stream it to view whenever. My home town boasted two theaters, sometimes grandly called cinemas: The Ritz and The Majestic. I didn’t reach the town that I called home in time to see my first movie. I began at The Grand in another county seat, 50 miles north, where I paid the price for a first-grader. Ten cents. sounds like chump change, but earning a dime took as much sweat, tears and ingenuity as a ticket in 2013. On Saturday morning our gang in Knoxville marshaled their four-wheeled Red Flyers, each about 3 feet long. We scoured alleys for scrap iron. Heavy grates were top-of-the line, followed by bicycle sprockets and fenders and at the bottom, tin cans. Railroad track, fish plates and spikes lay beyond our dreams. About 11:00 AM our troop reached the junk yard. Mr. Gavronsky weighed the junk tottering on our coaster wagons, and if the boy was lucky, swapped his metallic load for Mr. Gavronsky’s ten metallic pennies. At 1:00 PM the gaggle reached The Grand, to be measured against the height of the teller ticket counter, the small shelf where the clerk took the dimes. If a tall, older kid approached, he owed the astronomical quarter dollar that adults paid. But that was before the Great Depression in 1929. The show opened with a serial where monkeys pedaled tricycles. A Pathe’ newsreel showed Hitler’s rising brown-shirts goose stepping. In the main feature, a cowboy in a black hat chased a cowboy in a white hat to a precipice, drew his six-shooter and the movie ended, to be continued next Saturday. By 1935 the Waggoners had detoured through South Dakota, deflation and hard times to reach my home town. Centerville, Iowa was another county seat that boasted two move theatres. The Ritz for whoop-and-holler entertainment and The Majestic, where I enacted the climax of my story. The price was still 10 or 25 cents. By then I hunkered down, vainly trying to win classification for the 10 cent ticket. I raised my money by working for dad in his new store. 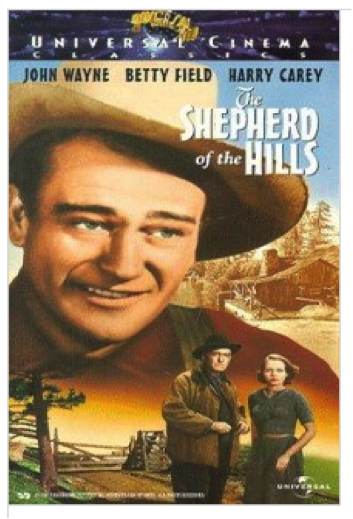 The program had become: coming attractions, the news, and the Shepherd of the Hills set in the Ozark Mountains and starring John Wayne, starting his ascendance to immortality. Then as in 2013, I sat with friends and talked at the wrong time. A large man in a three piece-suit, erect in front of us, turned and said with authority, “Be quiet.” He was Mr. Bradley, the town banker. Quiet reined.